A cosy homestay in Wilson Garden, Bose Compound is perfect for a quiet weekend with books, music and doggo. Or visit it for cultural events that take place on the terrace. Are you a writer looking for a quiet space to work on your next novel? Or a creative artist who just needs to get away from all the hustle and bustle? We’ve found just the place, and it’s called Bose Compound. 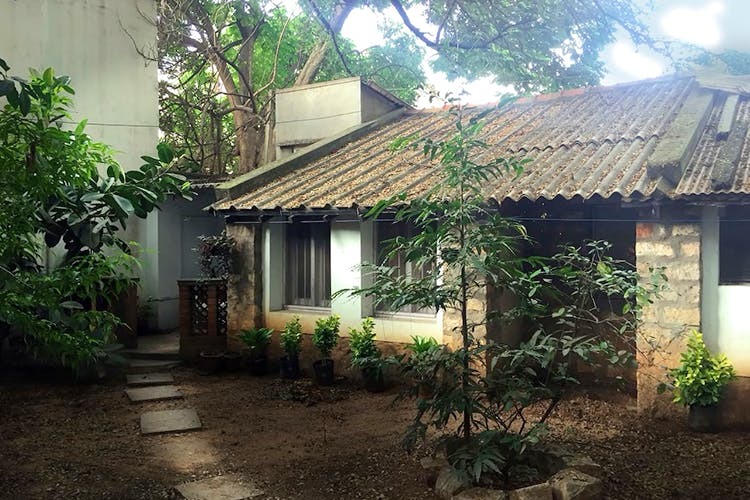 Nestled between tall green trees, this homestay was built in 1930, which means, it’s one of those rare Old Bangalore houses, with brick walls, arches separating room and the quintessential Mangalore tiles. Rustic ambience coupled peace and quiet are what you’ll get here. So take a book and catch up on reading. Unless you want to just nap with you BFF — human or furry, as it’s a pet-friendly property. Our favourite spot here is the patio area which has two comfy cane chairs for you to lounge about in. Fairy lights make it romantic at night, especially since it’s so disconnected from the big city life. We’re getting staycation feel, again! There is a little kitchen for you to whip up meals too. But do take groceries so you don’t have to hunt around when there. Or Maggi, which is an all-time favourite. Into yoga or meditation? The rooftop is the perfect space for you to do either. Split into two parts — a closed space and an open-air terrace space, it doubles up as an activity and event space as well. Every now and then, Bose Compound hosts performances, plays, workshops, and all things cultural and creative. Check out the performance space here. At the time of publishing this recommendation, the per day charges were at INR 1,460 for a single person. It’s INR 2,031 for two. You can book here. To book the rooftop space, email manjusapru0691@gmail.com.